WineUp - Easy and fast way to handle your wine list. 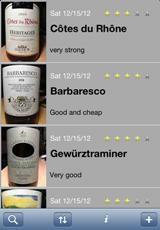 Easy and fast way to handle your wine list. Browse the list, sorting by date, rating or description. Take pictures of front and rear labels, assign rating, type and brief description and add comments. Type few characters into the search field to filter items by description and comment content. Tap on pictures for full screen view and zoom, optionally delete and retake them.